As you know I’ve been a big supporter of Zainey Laney Wax Melts from the moment they launched and I’ve talked about waxes I was scent as well as ones I purchased. 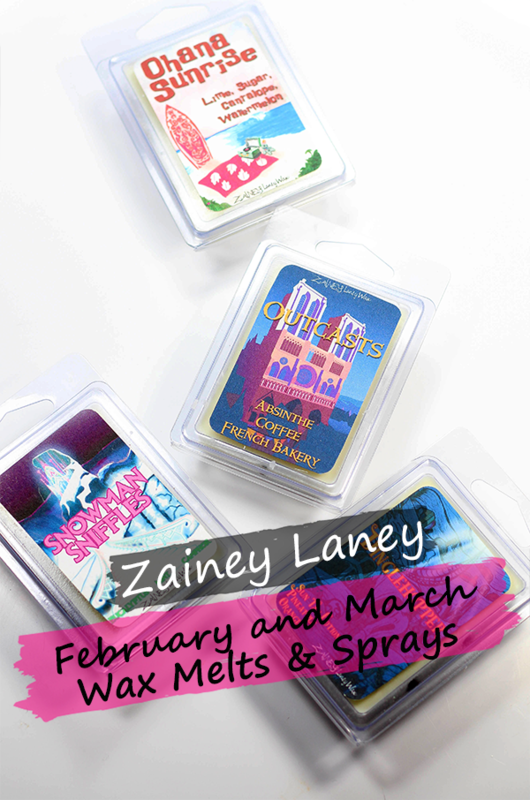 Imagine how delighted I was when Laney announced the Zainey Laney Body Sprays to go along with the wax melts! If you imagined jumping up and down and squealing then yes, you were right. 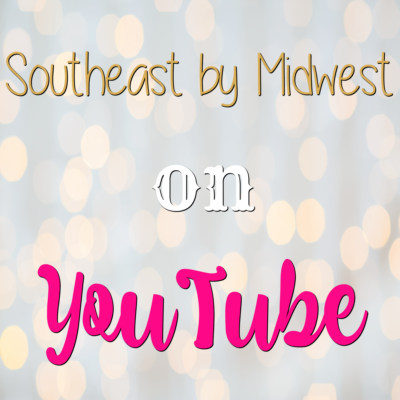 For more information on the Zainey Laney Body Sprays and the past two months Wax Melts then check out the video below (yep I’m back on the YouTubes) or just keep scrolling! Before we get into the body sprays let’s talk about the two recent months of Zainey Laney Wax Melts. February’s Zainey Laney Wax Melt theme was “Not Part of Their World” which means that all scents were based on Disney characters! If you’ve been around the blog for awhile then you know that I LOVE Disney so I was all OVER this box! The four movies that were featured in the February box were The Hunchback of Notre Dame, The Little Mermaid, Frozen, and Lilo & Stitch. Let’s see what all they came up with! 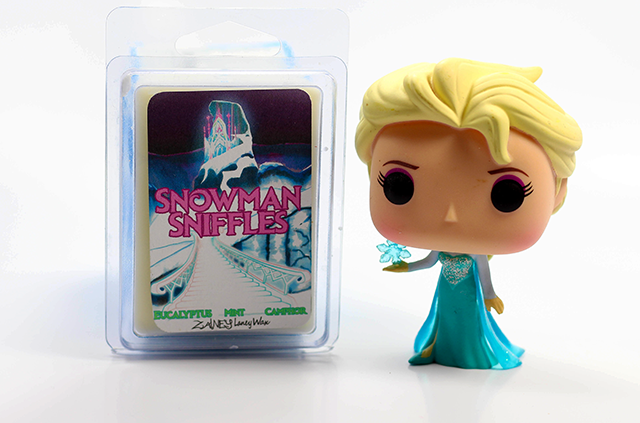 As you can see Snowman Sniffles is the scent that is based on Frozen. Snowman Sniffles has the scents of Eucalyptus, Mint, and Camphor. Hands down this was my favorite scent in the box and if you’re stopped up or sick then you’re going to wish you had this scent for your warmer. Purchase this clamshell by itself here for $4.00. 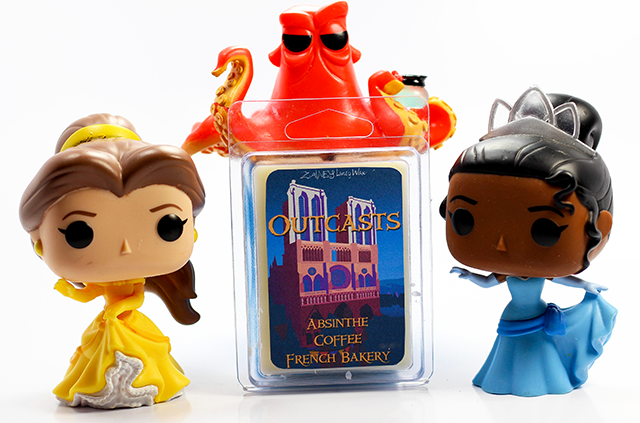 This one might be a little harder to guess but Outcasts is the scent that is based on The Hunchback of Notre Dame. Outcasts has the scents of Absinthe, Coffee, and a French Bakery. This scent is one that actually morphs as it ages. When I first received it the scent of the French bakery was the strongest and made it a little to sweet for me. However, almost two months after it’s pour date you get more of the absinthe and the coffee and it is AMAZING! 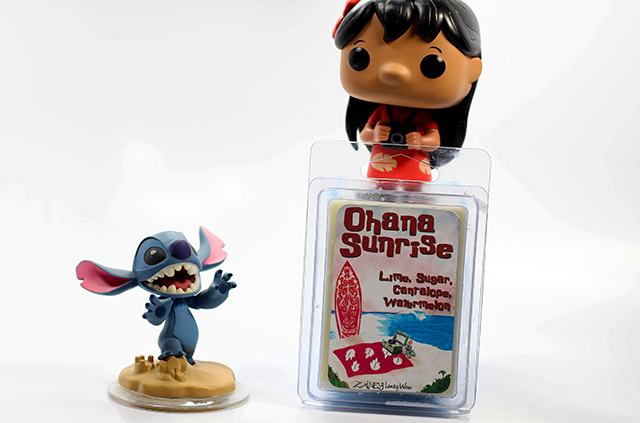 Ohana means family and Ohana Sunrise means that this scent is based off of Lilo & Stitch. Ohana Sunrise has the scents of Lime, Sugar, Cantaloupe, and Watermelon. If you’re someone that isn’t a big fan of watermelon then you still might want to give this scent a try as the watermelon isn’t the scent that you get the most. You really get the lime, sugar, and a hint of melon but that’s it. Purchase this clamshell by itself here for $4.00. 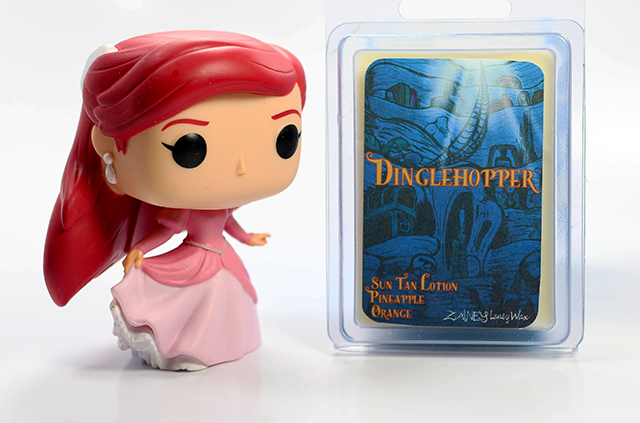 Of course Dinglehopper is the scent that is based off of The Little Mermaid. Dinglehopper has the scents of Suntan Lotion, Pineapple, Orange, and Pomegranate. The main scents that you get with this one are the Pineapple and Orange with a hint of the suntan lotion. 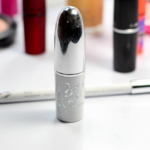 At first it can be a little off putting but I found that after going back in that the scent is actually a good one and what throws me is that I’m expecting that Hawaiian Tropic Suntan Lotion kind of scent and that’s not what you get at all, which I like. Purchase this clamshell by itself here for $4.00. 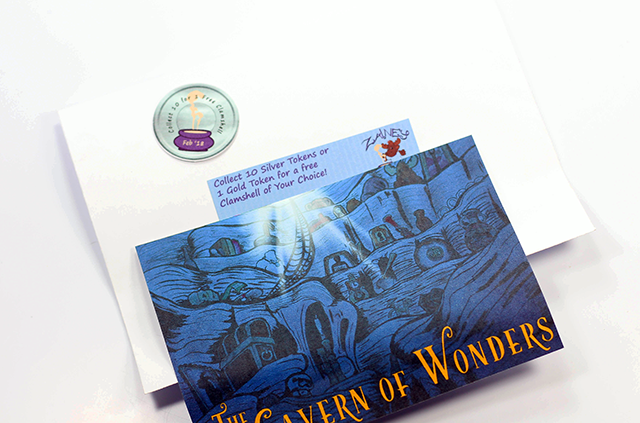 You can purchase the Not Part of Their World box with it’s four clamshells here for $15.00. Use the code CASSIE10 to save 10% as well! Darkness Must Pass is the scent that Valerie came up with and is based off of Sam from The Lord of the Rings. Darkness Must Pass has the scents of Rain, Mountain Wind, and Snow Peaks. This is a very fresh and watery scent with an outdoorsy vibe to it but not an evergreen scent. 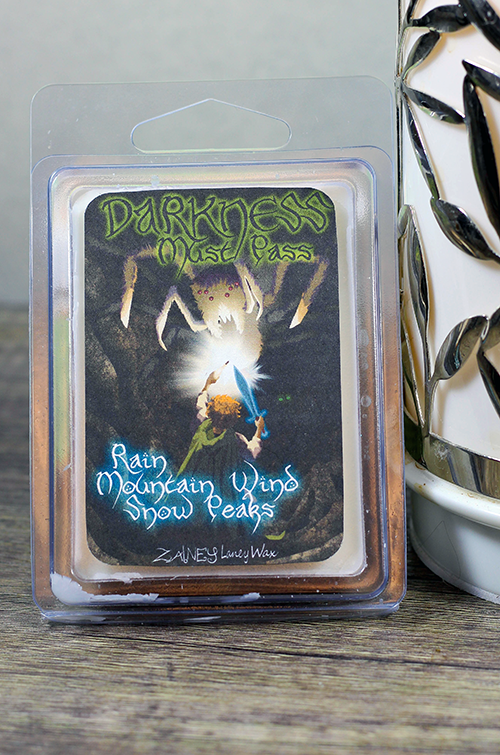 Darkness Must Pass is by far in my top 3 favorite scents from Zainey Laney. Purchase this clamshell by itself here for $4.00. 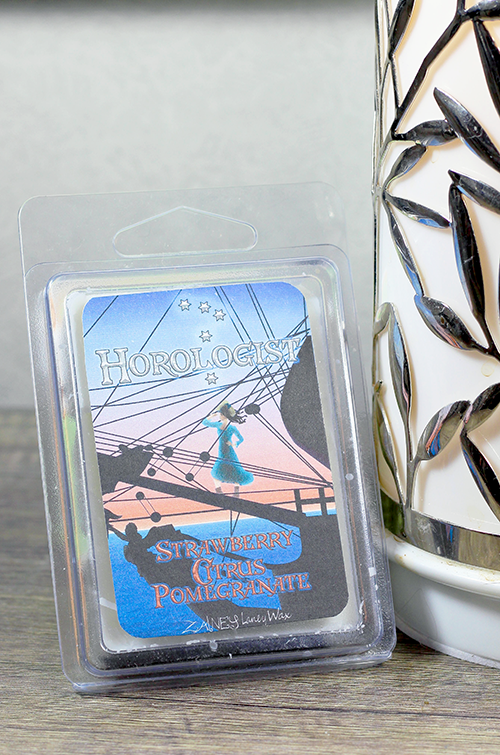 Horologist is the scent that Lisa came up with and is based off of the newer Pirates of the Caribbean. 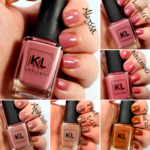 Horologist has the scents of Strawberry, Citrus, and Pomegranate. This is a very citrusy scent that is in the same family as Ohana Sunrise and Dinglehopper from the February box but completely different. Purchase this clamshell by itself here for $4.00. Kattegat is the scent that Omneya came up with and is based off of the TV show Vikings. 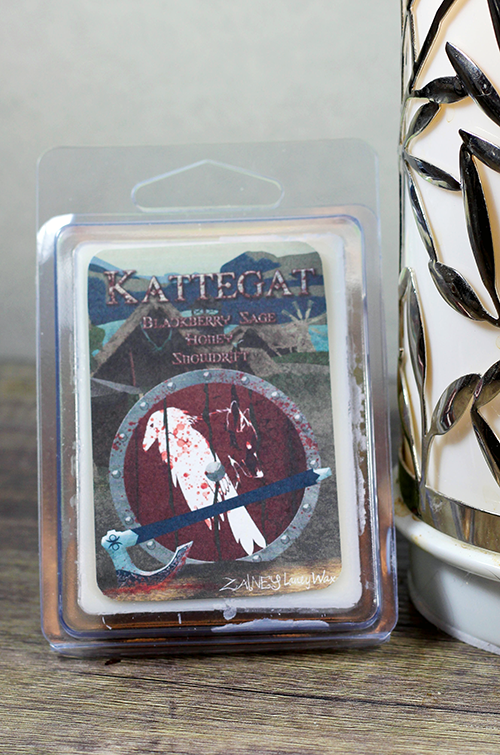 Kattegat has the scents of Blackberry Sage, Honey and Snowdrift. You can really smell the sage and honey in this one and in all honesty it’s not MY favorite scent but I can see others really enjoying this scent. Purchase this clamshell by itself here for $4.00. 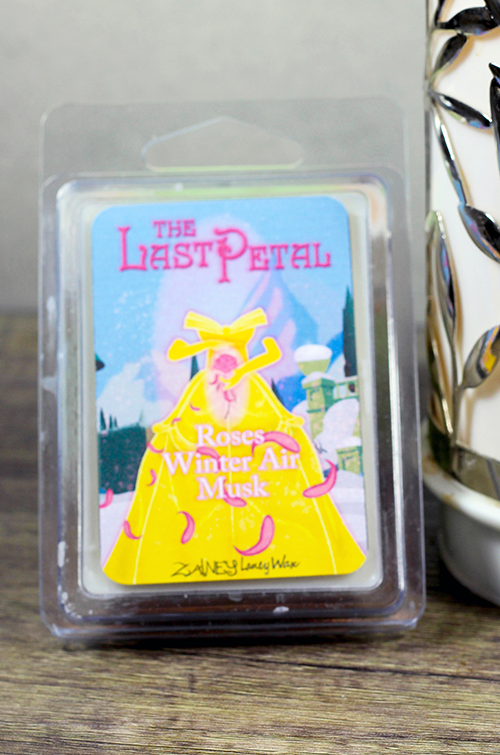 The Last Petal is the scent that Christina came up with and is based off of Beauty and the Beast. The Last Petal has the scents of Roses, Winter Air, and Musk. If you’ve been around for awhile then you know I’m not the hugest fan of floral scents. However, this is a floral scent that actually isn’t that bad as the winter air cuts down how rose scented it is. Purchase this clamshell by itself here for $4.00. 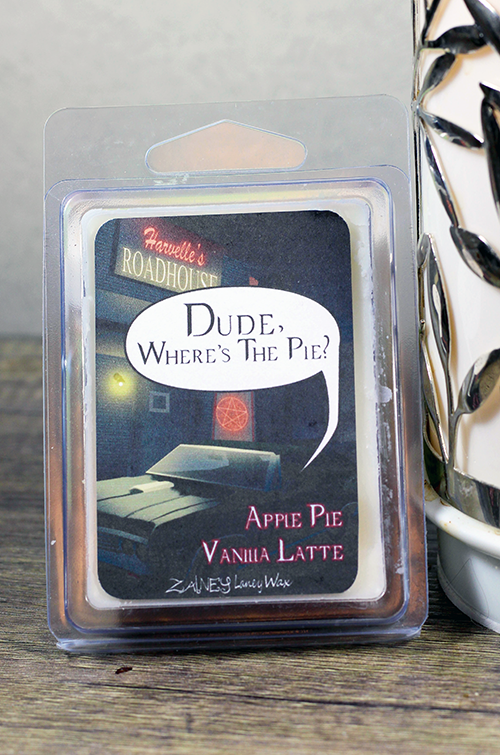 Zainey Laney Wax Melts: Dude Where’s the Pie? Dude Where’s the Pie? is the scent that I created and is based off of the TV show Supernatural. I picked this scent because of Dean’s love of pie and coffee and the quote is from an episode where Dean sends Sam out for pie and he doesn’t return with any. Dude Where’s the Pie? has the scents of Apple Pie and Vanilla Latte. I LOVE how the artwork AND the scent turned out for this one. Purchase this clamshell by itself here for $4.00. You can purchase the Fan Roulette box with it’s five clamshells here for $20.00. Use the code CASSIE10 to save 10% as well! As I mentioned before, the team at Zainey Laney recently released body sprays of their scents. These sprays are safe to use on the body, as room sprays, and even as car sprays as well just avoid leather. 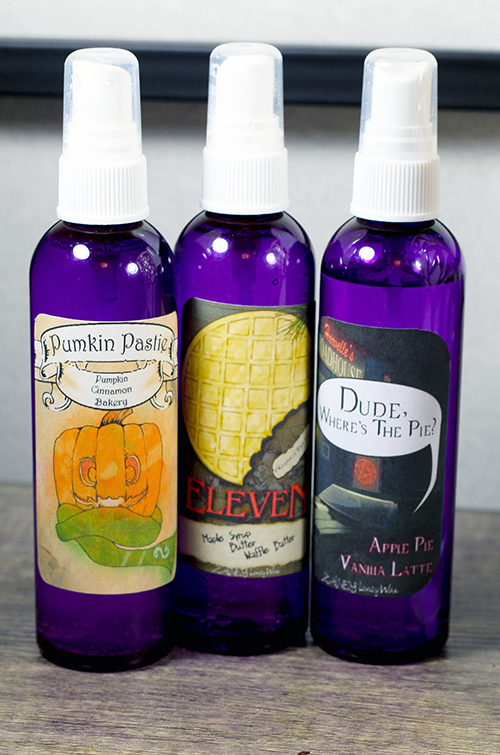 I picked up a spray of the Dude Where’s the Pie, Pumpkin Pasties from the Harry Potter box, and Eleven from the Stranger Things box. The sprays are amazing as body / room / and a car spray. 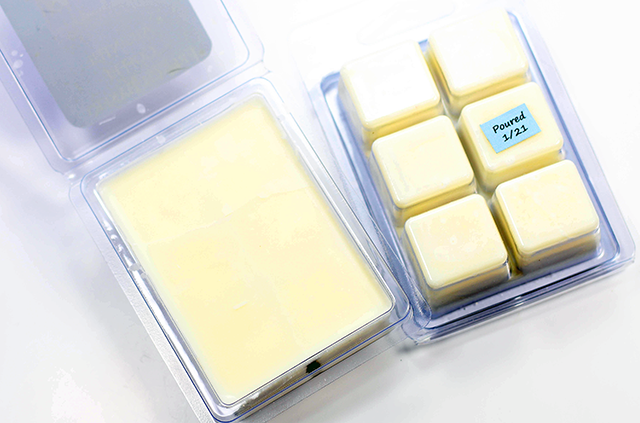 It’s long lasting, the scents hold up well, and are just as good as the wax melts. If you like the idea of the scents but just aren’t into the wax melts then the sprays are for you. You can purchase the sprays here for $8.00. If you’re a fan of Disney or the other scents then you like wax melts then you need to pick up either the boxes or the individual clamshells. However, if you like them but aren’t a wax melter then you for sure need to pick up the body sprays. 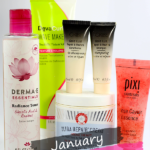 Don’t forget to use code CASSIE10 to save 10% if you do. I had never heard of this brand, but I really, really love that they go all out with their themes. Everything seems well thought out and the art is very cool. They really do go all out. I worked with Marshall for quite awhile on the art for Dude Where’s the Pie so I can only imagine how much work he puts into a regular box! 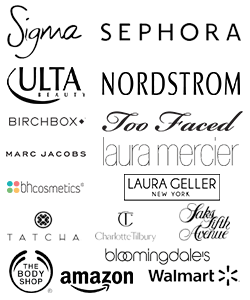 So many of these scents sound really great! I haven’t used my warmer in a while (kitten in the house) but I’ll have to remember this brand. 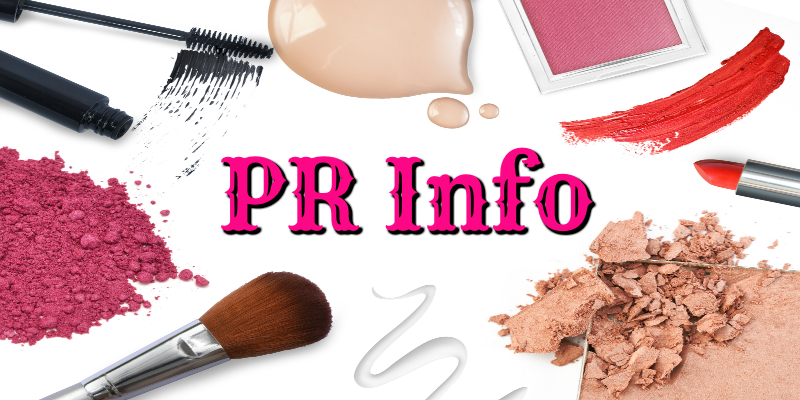 Yes there’s is phthalate free and non-toxic. They actually have cats in their house where they make and test the waxes. When you’re ready to use waxes and you’re looking for some pop culture / geeky themed ones for sure give them a look. I’d be interested to try the melts! I loved watching your video. I hope you are feeling better after that nasty cold, and kudos to you for speaking out – it was definitely a very big YTer who caused that major issue, but his channel wasn’t closed down, obvs. Ugh. I first saw the pictures and thought the wax melts were shaped like Disney characters! Bummer LOL. Ha! That would be cool if they were shaped like Disney characters. Maybe they’ll do something like that down the line. Can you believe that that same guy actually just created a gaming channel as well?